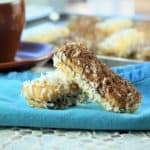 Chocolate Hazelnut and Mascarpone Lady Finger Bites, the perfect bite sized treat that you can prepare in minutes and require no baking! Chocolate Hazelnut and Mascarpone Lady Finger Bites are the perfect treat especially if you’re looking for a quick, no-bake last minute dessert! If you are fond of tiramisu and thought that was easy to make, then wait until you try these. I first tasted these delicious little bites while vacationing in Sicily two summers ago. My family and I were at a restaurant with about thirty members of my extended family enjoying a never ending feast that I will never forget. I thought I was way too stuffed for dessert until my cousin’s wife pulled out a tray of these. Just a small, light treat, right? I can’t believe I had never seen these before. My children and I eagerly devoured a few and took the leftovers with us! 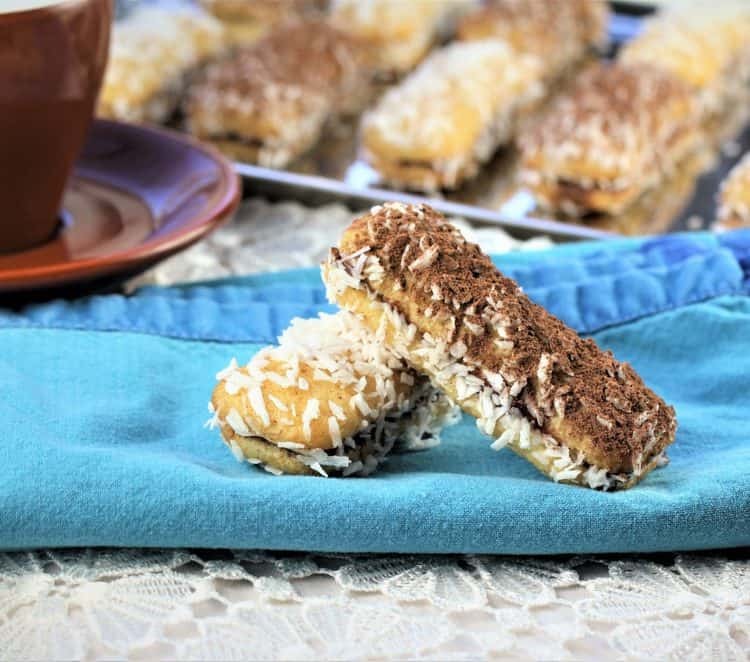 Lady fingers, chocolate hazelnut spread, mascarpone cheese and shredded coconut. What a perfect combination! For the sake posting a recipe ’cause I really have to share these with you, I actually wrote down a recipe with exact measurements of the ingredients I used. But seriously, the recipe can be summarized in a sentence. 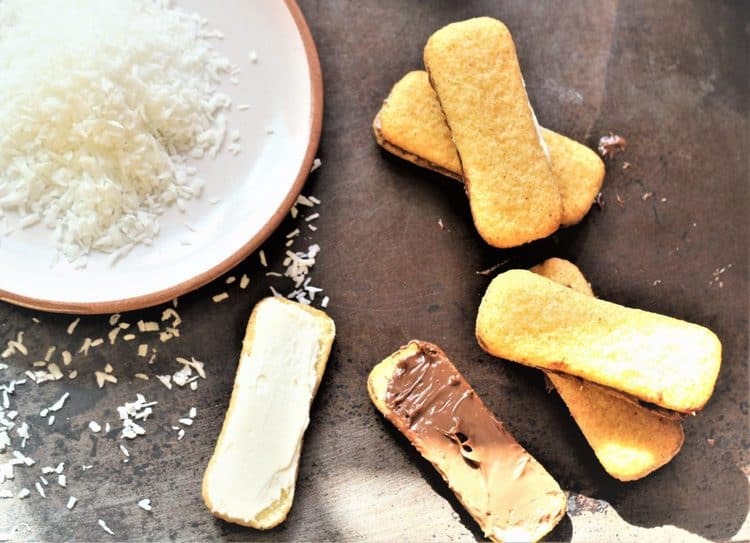 Cover a lady finger with chocolate hazelnut spread; spread mascarpone cheese on a second lady finger; press both cookies together to form a sandwich; dip in milk and dredge in coconut flakes. If desired (which I strongly recommend) dust with cocoa powder for a lovely presentation. Okay, so that was two sentences! There is one more step: place in the refrigerator for about half an hour before serving. You want the cookies to soak up the milk and soften up before serving. The lady fingers I used are tiny, approximately two inches long. More specifically they are the Italian Pavesini brand (not sponsored). You can use any sized cookies you’d like, but I think these are the perfect two-bite sized cookies. If you’re serving them to a group of children allergies to nuts may be a concern. 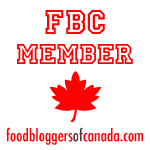 However, you can easily find a nut-free chocolate spread in grocery stores. If you’re serving these to adults, consider dipping them in a combination consisting of half milk, half espresso coffee. Allow the coffee/milk mixture to cool before dipping the cookies. Instead of coconut flakes, dredge the bites in finely chopped nuts of your choice. Or you can skip the nuts and coconut completely and simply dust with cocoa powder. 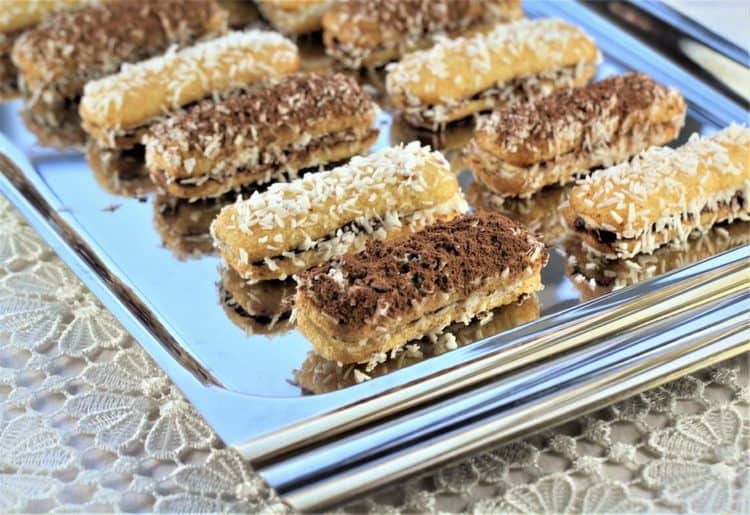 Chocolate Hazelnut and Mascarpone Lady Finger Bites, a must try treat! Please let me know how you like them by tagging me with @mangiabedda or #mangiabedda along with with your photo on Facebook or Instagram. Buon appetito! Chocolate Hazelnut and Mascarpone Lady Finger Bites are the perfect no-fuss, no-bake last minute snack or dessert. Made with just a few simple ingredients, everyone will love these adorable little bites! Pour milk in a shallow dish and shredded coconut in a second dish. Cover a lady finger with chocolate hazelnut spread, spread mascarpone on a second lady finger. Press together to form a sandwich. Dip both sides in the milk, then dredge in the shredded coconut. If desired, dust lightly with cocoa powder. Refrigerate for about half an hour before serving. If you're serving them to a group of children allergies to nuts may be a concern. However, you can easily find a nut-free chocolate spread in grocery stores. If you're serving these to adults, consider dipping them in a combination consisting of half milk, half espresso coffee. Allow the coffee/milk mixture to cool before dipping the cookies. What a delightful fuss free treat these are especially with the warmer temperatures when we are much more reluctant to turn on the oven! And lovely photos Nadia! ??? ?